Although a simple frosting, buttercream is one of the most popular. Buttercream is a type of icing or filling used inside cakes as a coating or decoration. It is simply made by creaming butter with powdered sugar. Sometimes colorings and flavorings are added. Buttercream icing appeared around 20th century when it replaced traditional boiled icing.1 This was about the same time commercial butter was widely available. Simple buttercream, also called American buttercream, is the most common buttercream variation. It is made by creaming butter, shortening, or a combination of both, confectioners’ sugar, milk or cream, and some kind of flavoring until everything is smooth and fluffy.2 Simple buttercream holds up well in warmer weather when it is made with at least 50% shortening.3 It is very sweet. It can have a grittier mouth-feel compared to other frosting.3 Chocolate buttercream is the most popular flavored buttercream in America. To make German buttercream, butter is beaten into a flavored pastry cream (consisting of milk, sugar, egg yolks and cornstarch) to form a rich, thick buttercream.4 Though it is very smooth and flavorful, it is also a softer frosting. Unfortunately, it has a yellowish tint, which makes it difficult to color.4 Typically used for filling cakes, the German buttercream is not used very often for frosting. “Buttercream Icing.” IFood.tv. http://ifood.tv/icing/buttercream-icing/about. Accessed 20 Apr. 2017. Nicole. “What Is Buttercream?” Baking Bites. 20 Oct. 2011. http://bakingbites.com/2011/10/what-is-buttercream/. Accessed 19 Apr. 2017. Modos, Alyssa. “WTF Is Buttercream?” Spoon University. 14 Feb. 2017. http://spoonuniversity.com/lifestyle/buttercream-what-is. Accessed 19 Apr. 2017. Gardner, Erin. “Types of Buttercream: Pros & Cons of Each, Plus Tasty Tips.” The Craftsy Blog. 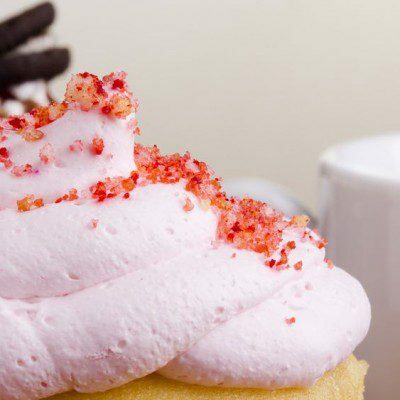 5 Nov. 2015. www.craftsy.com/blog/2015/11/types-of-buttercream/. Accessed 20 Apr. 2017. Function and Fun: It is Cake After All!